The International Society of Nephrology’s (ISN) biennial World Congress of Nephrology (WCN) is the premiere educational event in nephrology. This year’s congress took place in Mexico City from April 21-25. For the first time, an international nephrology meeting focused on diabetes and kidney disease, a worldwide problem, but one of particular importance to Latin America and especially to Mexico. TRENAL researchers were of course involved. The TRENAL team congratulates medical student Theresa Ermer on having her clinical research abstract “Impact of regular or extended HD and HDF on plasma oxalate levels in ESRD patients” selected as both moderated poster and oral abstract presentation. In conventional hemodialysis (HD), molecules in the patient’s blood are moved across the dialysis membrane into the dialysis fluid following a concentration gradient. Hemodialfiltration (HDF) is a more intensive dialysis mode in which an additional fluid volume is administered. This additional fluid volume can “drag along” additional molecules from the patient’s blood into the dialysis fluid. Therefore, HDF is currently under investigation for defining its possible benefits to patients with end-stage renal disease (ESRD). Oxalate accumulates in the plasma of patients with ESRD because the main excretory route for oxalate via the kidneys is not available anymore. In previous studies an improved plasma oxalate reduction was achieved with HDF as compared to HD. However, in our study, neither HDF nor an extended treatment time provided any added benefit for plasma oxalate reduction. New discoveries in science and technology on a day to day basis make it imperative to consistently update our medical knowledge base to provide the best possible care to our patients, Theresa explains. 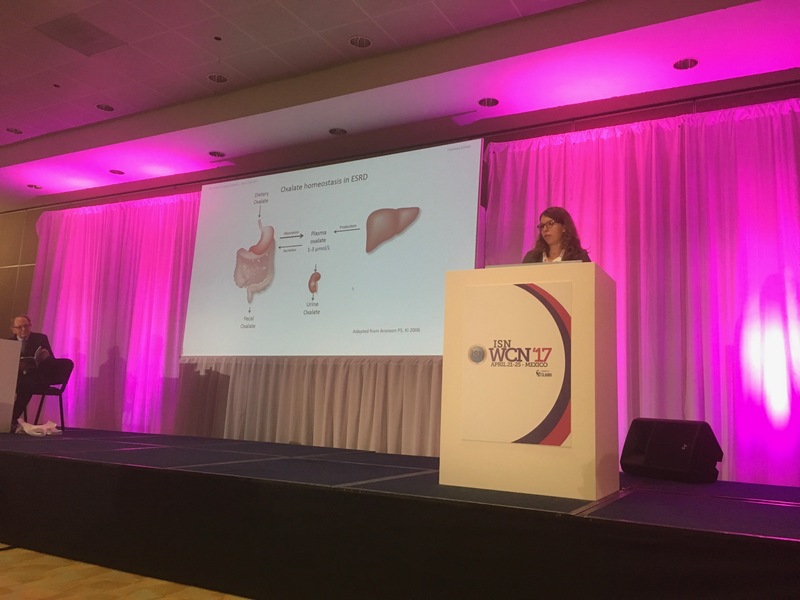 Over 1500 abstracts were submitted for the WCN 2017, whereof approximately 900 were chosen for moderated poster and only 28 for oral abstract presentation. Theresa had the opportunity to present her project in the session “Using water wisely.” chaired by Drs. David Harris and Nathan Levin.